Sativa plants are popular for their high yield and high effect and can grow up to five meters or more in the wild and easily bloom for 16 weeks or more. Fortunately, we have done a lot of work in the field of growing sativa dominant hybrids over the past 20 years and have succeeded in making various Sativa dominant hybrids which have many sativa properties but lack the extreme height and flowering times of their parents. The sativas are made suitable for our indoor cultivation with the strong high and high yields that we like to see in sativa plants. 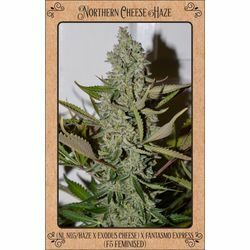 The high effect of Sativa plants is the essence of this cannabis species, the real uplifting high that Haze provides is impossible without longer flowering times. A neutral energetic high which lasts for a long time is what we are looking for and also bring to our sativa seeds. Sanniesshop supplies various sativa varieties from landrace and hybrids to autoflowering sativa seeds. How did cannabis Sativa originate? Cannabis sativa originated in the hot and humid climates of India, Mexico, Thailand and Colombia where the plant had to learn to cope with the humid climate or to grow up against high mountains. Evolution thought it was a good idea to create longer plants with the flowers further apart in order not to rot in the humid climate, long slender leaves provide a more effective evaporation process. By getting less light intensity and light hours, the species bloom longer to obtain their yield and thus can reproduce. Each sativa variety will vary depending on region or country of origin, these are called pure landraces. Because of the high THC content and combination of the cannabinoids, a sativa plant is capable of taking you to another dimension, strong up high which becomes heavier in stages and will last for a few hours. Cannabis sativa stimulates the artistic skills of the user and allows you to experience a different side of the world. Sanniesshop sells sativa seeds that have been specially developed for indoor cultivation and can therefore be finished without problems, sativa cannabis seeds that produce well-yielding plants with the desired haze effect. A sativa-dominant plant should have a large and high space to its disposal in order to handle the height of the plants. Two meters is the bare minimum if you let the plants grow freely. That is why we advise you to grow and flower Sativa dominant plants in a SCROG setup, this is a setting where you hang a net just above your plants and tie all the shoots that grow above the net onto your net. This way you have full control over the height you want to give the plants, because of the rapid growth the net will be quickly filled and an evenly sea of buds will arise.